That’s why we made you an awesome cutout explorer mask and walkie-talkie, so if you were low on Halloween costume ideas, we got you on this one! But, like we said before, our love for horror and thrills doesn't stop at a little Halloween present. We are working day and night to make We Were Here Too even more mind-blowing than We Were Here. And we promise you, the scariest part is yet to come… ? Oh, and don’t forget to send us your best Halloween pictures. We’d love to have you try and scare us, for a change! Welcome to the first Total Mayhem Games blog post! Let me first introduce ourselves to you, dear reader. We, Total Mayhem Games, are a young Rotterdam based Indie Game Studio who recently launched their first game, named ‘We Were Here’. It is a free-to-play game, which we present to you on steampowered.com. You don’t need any money to play the game. Just a computer, a friend and your voice. Well... you don’t even need a friend, you are able to play the game with a complete stranger if you want to. As long if there is a ‘we’ in ‘We Were Here’. We are a group of six game enthusiasts, who were able to bring their passion to the next level: this resulted in game development. Which, even if we really couldn’t, we would probably still do. But that’s what makes passion a passion of course. And if you are passionate about something, you probably know everything about how passion feels. We signed We Were Here up for Steam Greenlight, managed to get approval in only 3 weeks and launched the game on February 3rd 2017. This all happened between the walls of the University of Applied Sciences in Rotterdam. Maybe you already know, maybe you don’t, but we are all still students. Except for one by now, our programmer Sam was the first to graduate (thank God, one functioning adult in this team, which is also the youngest member - life is strange). We organized this big party to launch our game and the two other games that took part of the minor - Pool Party Panic and Cat Rekt (we only had 4 weeks to prepare the party; we’ve gone through organizing-hell with that). Our set goal was to publish a viable game within 14 weeks with 15 students (we are now with six left from the original team), some more rules that I forgot, and 1000 downloads before 00:00 on February 3rd. And that meant the whole production from beginning to end, even just coming up with what kind of game we wanted to create and develop. Imagine we only had one 3D artist. One… He’s still with us luckily, modeling next to me as I type. Okay… Back to the assignment. So we launched We Were Here on the 3rd at 18:00 on Steam. We were scared. We were afraid. Some of us were probably also already drinking away their nerves and fear of failure. And then the moment came when one of our 15 team members looked up the numbers of the current downloads, which were a few thousand in just 2-3 hours. You can probably imagine our reaction. This wonderful, somewhat blurry picture shows our excitement quite well. Maybe you'll recognize some of our team members. And me: with purple hair. Hey everyone! Even though we’ve been very busy lately, we would like to share with you some minor improvements and additions. Please let us know if you still experience issues. Have a great weekend from the Total Mayhem Games team and make sure to follow us on Steam and our social network channels these coming weeks! Hey everyone! Update Four is brought to you from our new office space where we'll be working on We Were Here for the upcoming months! If you still experience an issue that is listed or new issues have presented themselves please let us know in the comments. As of today some new features have been implemented in the game as we continue to make it more stable. In this patch note we will highlight a couple of important fixes and features listed below. We are aware that not all bugs might have been fixed (such as the walkie-talkie in some cases), but since we’ve already made some progress we wanted to share this with you. We would also like to thank the community for embracing our game, reporting issues and overall helping us make the game even better! We are rolling out a new update that fixes several issues and adds a much-requested feature.We will continue to improve the stability of the game with future updates. Thank you for playing We Were Here! I've seen several posts about the theater, the solutions given in the guide are no longer correct. Some solutions given in the guide were marked as correct due to a bug. We are aware several players are having trouble launching the game, we are doing our best to solve this problem. Connection errors have been resolved! We never dreamed of being featured in the Popular New Releases section on Steam. Which is why our servers weren't prepared for the massive spike in concurrent users we experienced last night. So when our servers started overheating, we put our heads together to find a way to upgrade our servers within the limits of our Free to Play model. Special thanks to Rob, Geoff and Bob for looking out for us. 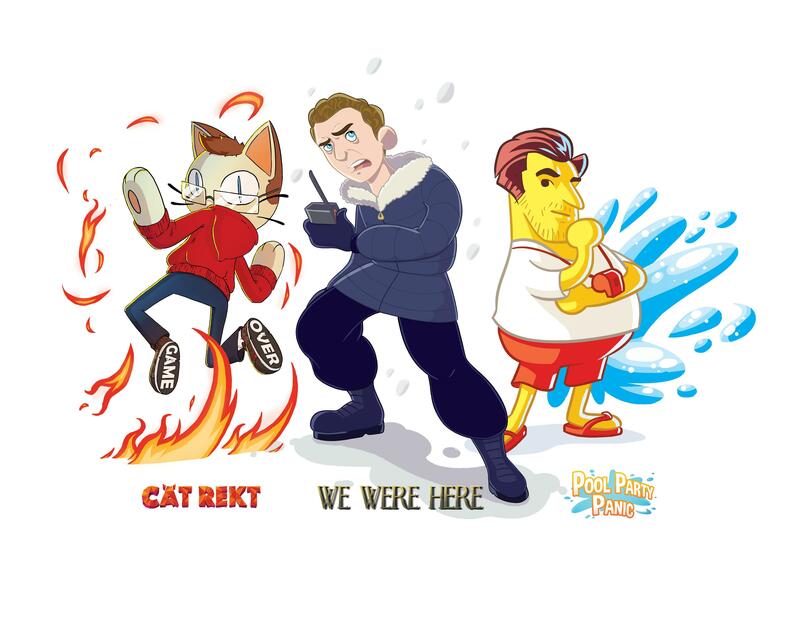 To maintain a certain sense of privacy and anonymity, we've added a picture of them immortalized as in-game characters of the recently released indie games Cat Rekt, Pool Party Panic and of course We Were Here. All games made by young indie game studios, and all mentored by them. We'd also like to thank everyone for their patience while we addressed these issues, and we hope you give our game another try if we ruined the first impression! We would like to thank everyone for playing We Were Here! We are aware of some of the issues some players might be having and are monitoring the discussions to see what other issues arise. Below you will find a list of issues that have been fixed for this first patch. We are also looking into some of the feature requests posted in the reviews/discussions to see if we can make these happen. Again a big thank you from the We Were Here team, if you have more feedback or feature requests you can post them in the Steam discussions.